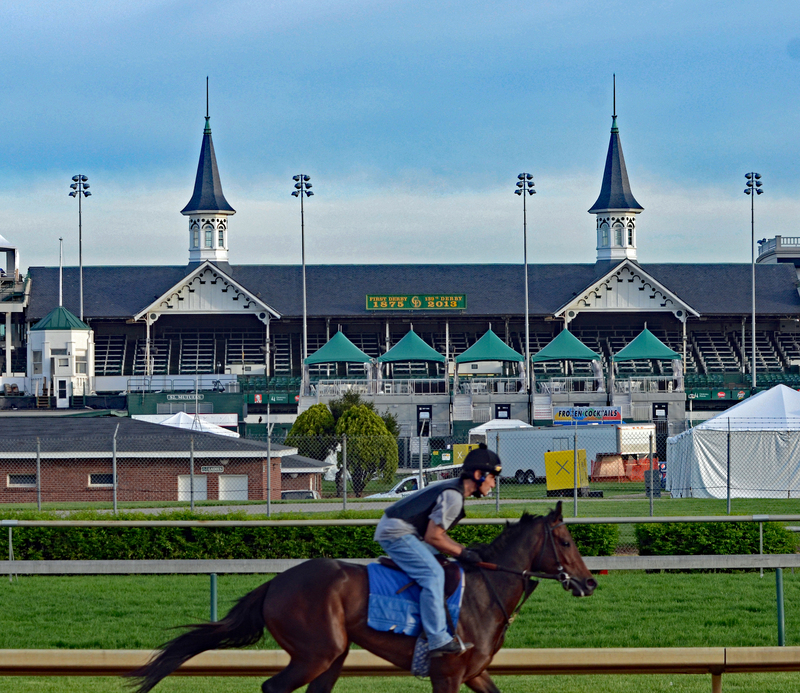 Churchill Downs (photo by Tom Ferry). Good handicappers know that you just can’t base your handicapping solely on betting the leading jockeys. This is especially true at the Breeders’ Cup, where, let’s face it, they’re all top jockeys. When it comes to jockey handicapping in the Breeders’ Cup, horseplayers will need to delve beyond simply looking at the current win percentages of the jockeys. At this level, you are dealing with the best of the best, and just picking a jockey with a good current record is worthless and not worth basing your bets on. Nevertheless, a horse’s jockey does matter in the Breeders’ Cup, where you want to rely on big-money riders that can win in the big spots. Handicapping the Breeders’ Cup is a complex puzzle with too many variables to list. We must weigh factors such as speed, pace, trainers, current form and much more in order to come up with selections in every Breeders’ Cup race. However, no matter how well a horse is prepared and how well the horse has been spotted, once the bell rings and the gates open, it is just the horses and their jockeys who are ultimately responsible for the outcomes of the races and whether or not you will cash your bets or tear-up your tickets. Is the jockey an experienced and proven winner of Breeders’ Cup races? Is the jockey the horse’s regular rider and has the horse already been successful with the Breeders’ Cup Day jockey aboard? Has there been a jockey switch aboard a horse for the Breeders’ Cup? Was that switch positive of negative? Is the regular/former rider choosing another horse? Let’s take a closer look at these handicapping points in more detail, in order to see how you can use jockeys to help you make choices on Breeders’ Cup weekend. Several of the all-time winningest jockeys in Breeders’ Cup history are still active. 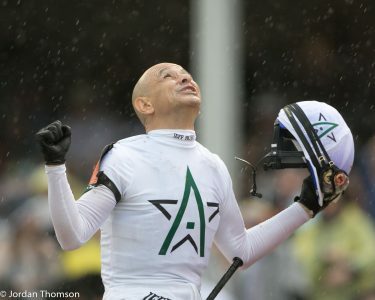 The all-time leading rider in the history of the Breeders’ Cup is Mike Smith with 26 career wins, and there is no better rider to have aboard your horse at the Breeders’ Cup than this veteran, proven big race rider. If the jockey is going to be a tie-breaker for you in your handicapping, Mike Smith is the king of this event and the guy you want aboard your contender. Other top active riders in Breeders’ Cup history may also improve your horse’s chances, such as John Velazquez (15 Breeders’ Cup wins, tied with Jerry Bailey for second all-time), Gary Stevens (11 wins, but just 1 win since 2013), Frankie Dettori (12 wins, mostly on grass, plus one Classic and one Juvenile) and Corey Nakatani (10 wins, great in the Sprint, but no wins since 2012). Some current jockeys with disappointing Breeders’ Cup career records so far include Kent Desormeaux (6 wins from 97 mounts; won aboard Roy H in 2017, but has only three BC wins since 2007) and especially Joe Talamo, who has been a Breeders’ Cup disaster (1-for-36 with only one place). Also, Victor Espinoza has had some high-profile mounts in recent years, but, in the Breeders’ Cup, he is only 3-for-63 lifetime, including his win on American Pharoah. A few other active jockeys not getting the job done include Jamie Theriot (2 wins, both in 2010), Robby Albarado (just 3 career wins, none since 2011) and Rafael Bejarano, who actually owns five Breeders’ Cup wins, but is just 3-for-81 lifetime aboard every horse not named Goldencents — this despite a ton of Breeders’ Cups being run in southern California during his career. So, if you can’t count on guys like Desormeaux, Talamo, Theriot, Albarado, Bejarano and Espinoza, who can you bet on in the Breeders’ Cup besides Mike Smith? Two good places to start are Javier Castellano, who is 8-for-100 with at least one BC win per year in each year since 2012) and Joel Rosario, whose 6-for-93 record is misleading because he’s won a race in each of the last four years, and has finished in the money 33 times for a very nice 35% ITM rate. Julien Leparoux has quietly racked up seven career Breeders’ Cup wins and Ryan Moore, who has crossed the pond for a total of nine BC victories from only 56 career BC mounts (16% win rate and 32% ITM rate). Young riders off to good starts in their Breeders’ Cup careers include Florent Geroux, who had two wins in 2015, one win in 2014, and one win in 2017 (in the Classic aboard Gun Runner). He is now 4-for-14 overall for 29% wins. 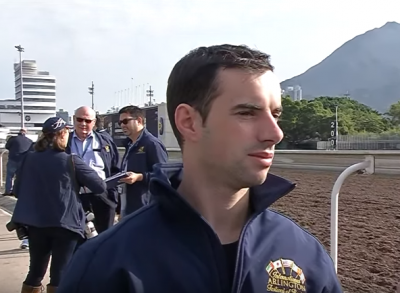 Flavien Prat is doing well with two wins already in his BC career, including the 2016 Turf Sprint with Obviously and the 2017 Dirt Mile with Battle Midway. If you follow New York racing or stakes racing in general all over the east, you are used to seeing the Ortiz brothers in the winner’s circle quite often, and the Breeders’ Cup has been no exception. Jose Ortiz already has BC wins, including the 2016 Juvenile Turf with Oscar Performance and in the 2017 Juvenile with Good Magic. Irad Ortiz, meanwhile, has done even better, with three BC wins already, including the 2017 Filly & Mare Sprint in an upset aboard Bar of Gold, plus the 2014 Juvenile Fillies Turf with Lady Eli and the 2015 Filly & Mare Turf aboard Stephanie’s Kitten. Finally, if you are stuck between two horses and looking at the jockeys aboard the contenders to perhaps be your deciding factor, it can’t hurt to consider how well a jockey knows the host track and how much experience he/she has on that particular surface. Every track and turf course has its specific ins and outs that can only be learned with experience. Churchill Downs is certainly one of those places. No matter how good a ship-in rider might be, sometimes it helps to have a locally based top jockey aboard your horse. A jockey’s experience on that track could come in very handy in a key situation in a big race. One notable exception this year, however, would be Calvin Borel, who is one of the all-time leading jockeys at Churchill Downs and known for his success in the Kentucky Derby. The Breeders’ Cup has been unkind to Borel, however, as he has won only one career BC race and been in the money only four times in 21 career mounts. Is the jockey the horse’s regular rider and has the horse already been successful with the jockey who will be riding on Breeders’ Cup Day? Florent Geroux (photo via YouTube). From a handicapping perspective, it is always beneficial to see a BC contender ridden by a jockey who already “knows the horse.” Many times trainers are faced with a decision in the Breeders’ Cup to stick with their regular riders or to take an “upgrade” by switching from a non-big-name rider to one of the marquee jockeys in the country. In these circumstances, I prefer to see the trainer stick with the horse’s regular rider, even if that rider is not necessarily a household name. In order to have arrived at the Breeders’ Cup and to be a contender worth your consideration, a horse should have racked up quite an impressive year. Chances are that a good portion of that success was due to the winning jockey(s). When readying a horse for the big race, it is up to the trainer to weigh the options and make the critical decisions to give a horse the best chance to win. These decisions include which jockey is the best fit to ride the horse. 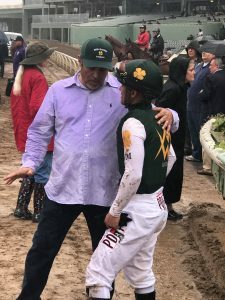 In my opinion, the trainers that make the right moves are the ones who stick with horse’s regular rider or, when all else fails, at least give the mount to a jockey that has already earned at least one win aboard the horse. Otherwise, I recommend downgrading horses with jockeys who have never ridden them, or have never won aboard them. Has there been a jockey switch aboard a horse for the Breeders’ Cup? Was that switch positive or negative? Did the regular rider choose another horse in the race? Trainer Mick Ruis and jockey Javier Castellano (photo by Margaret Ransom). Rider switches can be most confusing for the betting public, but reading something into these switches can form the beginning of potentially effective betting angles. Jockey choices, moves, and switches — both positive and negative — can help you separate pretenders from contenders. In the Breeders’ Cup there are always riding conflicts. Many jockeys are the regular riders of more than one horse in the race, forcing them to choose between horses (often this is a choice to ride for a specific loyal trainer). This can still amount to a handicapping angle for horseplayers. When jockeys choose one horse, or trainer, over another, it is a positive betting factor for the horse the jockey is choosing and a negative betting factor for the horse the jockey is off of. When factoring jockeys into your Breeders’ Cup handicapping, you must look deeper than just a jockey’s current record in order to help you pick winners. Instead, use tips like finding jockeys with winning records aboard specific horses, positive and negative jockey switches and betting riders with winning experience in Breeders’ Cup races and/or at the Breeders’ Cup venue to help you separate the contenders from the contenders on horseracing’s biggest and best weekend. Best of luck betting your favorite riders at the Breeders’ Cup!